Downbeat magazine 2/8/1952 with Josephine Baker! The February 8, 1952 issue of Downbeat with the banner headline that JOSEPHINE BAKER was calling out the one once famed gossip columnist, Walter Winchell, as “miss-informed”. 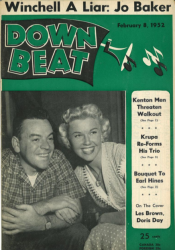 Besides the cover stories and the picture of DORIS DAY with her career launcher , Les Brown, there is coverage of: Basie back in business with a tour with Billy Eckstine; Louis Jordan’s retirement (he would return to action); and Symphony Sid being bumped of NYC airwaves (Sid Torin would soon move to Boston); and a 12 minute film that covered all of Jazz History.